Oral history interview of Dr. Storm Leslie Richards, an archaeologist and environmental consultant for Storm L. Richards & Associates, Inc. Dr. Richards was born in Patuxent River, Maryland, on August 20, 1950, but his family migrated to Sanford, Florida, in 1953. He graduated from Seminole High School in 1969 and received his B.A., M.A., and Ph.D from the University of Florida in Tallahassee in 1973, 1978, and 1987, respectively. Dr. Richards also wrote the grant for the Sanford Grammar School, located at 301 West Seventh Street. This interview was conducted by Ian McLaughlin at Dr. Richards' home in Geneva on October 24, 2012. Oral history interview of Dr. Storm Leslie Richards. Interview conducted by Ian McLaughlin at Dr. Richards' home in Geneva, Florida. Richards, Storm Leslie. Interviewed by Ian McLaughlin. UCF Public History Center. October 24, 2012. Audio/video record available. UCF Public History Center, Sanford, Florida. Digital transcript of original 19-minute and 04-second oral history: Richards, Storm Leslie. Interviewed by Ian McLaughlin. UCF Public History Center. October 24, 2012. Audio/video record available. UCF Public History Center, Sanford, Florida. Originally created by Ian McLaughlin and owned by UCF Public History Center. Alright, today is Wednesday, the 24th of October, 2012. It is 3:05 PM. I am with Dr. Storm [Leslie] Richards at his home in Geneva, Florida, and we’re going to discuss his experiences as related to historic preservation in Sanford, specifically concerning the Sanford Student Museum [and Center for the Social Studies]. We moved to Sanford in 1953. My dad was in, uh, the Navy at the time, and, um, we came here, uh, when Sanford was a very small community. It was very agriculturally-oriented. Um, there were many, many schools in Sanford. Uh, I went to, uh, about four of them, uh, from about elementary school through high school—all in Sanford, and then I went to Seminole Community College, which was what it was called at the time in the 1970s, uh, and got my Associate of Arts degree, and went on to the University of Florida and finished my Bachelor’s, Master’s, and Doctorate at, uh, the University of Florida in Gainesville. Um, did some graduate work at Tulane University, but, uh, for the most part, I was always at the University of Florida, and I had a very strong interest in historic preservation and archaeology and, uh, urban—urban development, and I think, uh, first time that I really became—became directly, um, associated with the school [inaudible] was I was asked to help write a grant. Um, he grant was originally through the Division of Historical Resources, which is part of Florida Department of State for doing architectural reconstruction and rehabilitation. Um, one of the things that came to me from the very, very beginning was that the school—the [Sanford] Grammar School was such a tremendous resource in terms of historically where[?] Sanford had been. It was constructed in 1907, I think—’02-’07, and, um, it had always been a real focal point for—for education for—for young kids, and I think, uh—I didn’t go to school there and—and I always remember the school having, uh, teeter-totters and having, um, jungle gyms and the having the maypole, uh, swing that the kids would swing around and stuff like that. It’s—it’s the kind of thing where you still remember the kids yelling and screaming, and just, uh, it was a very fun place. Um, academically, I can’t really speak for it, but, uh, I can remember that—that there was always a lot of activity there, and the school, uh, that I identified with the grant that I worked on was a very important hub for Sanford and for Seminole County to—to look at something historic and say that so many people had gone there and so many people’s lives had been involved. I just thought it was a wonderful focal point, um, to try to keep, and, uh, at that time, they were really the first time that they were getting into the notion of it being an historic properties, and being important for a museum, and—and I was just really, uh, excited about that for the kids to be able to go back and look at things the way they were a hundred years ago. All right. Um, in what capacity were you involved, specifically with the grant-writing process? Um, because I was—I am a certified archaeologist, and I have a really strong background in historic preservation with the University of Florida and the Urban Re-Use and Planning Department, I was asked to—to come in and take a critical look at if the site was really historic. Now, it had already been designated on the [U.S.] National Register of Historic Places, which one would assume would make it very important, uh, but because it’s part of a district, um, that’s not necessarily the case, and you really want a building like that to stand on its own, be—because the importance not of just the neighborhood, but the importance of it being, uh, the structure that was there, uh, and so I put together, uh, all of the documentation on, uh, why it was historically important, and what it meant to the community, and why the state should look at it as being not just some local landmark, but as something that was important to the county and the State of Florida. So I wrote that up, and what really ended up happening was that the state looked at that and felt that there was enough merit there that it was designated on a, uh, state list of very important, uh, uh, schools for the State of Florida and it was designated as such with that important notice. I think that the other thing that I did was, uh, I contacted a number of commissioners and a number of people that had on a say on, uh—on how money was being spent, whether it was the school board of, uh, Seminole County, because it was certainly a focus of not just the City of Sanford, but the county also, uh, and told them the importance of preserving that, because at a certain point, older buildings have a way of just deteriorating to the point that they can no longer be used, and it takes an investment, and sometimes, that investment can actually cost more than—than new construction, you know? Rehabilitation’s a very expensive proposition, but what it does for a community, in terms of identifying the importance of a city, and importance of schools, and importance of looking at the people who got an education there and what they went on to do, and is—and it is far more important than any single dollar value. Right, I see. About how long did that process take from start to finish? From the beginning to the end[?]? [laughs]. It took probably—the grants program probably took six months. I think though the writing that I did, because I had a familiarity with it, was probably in days. I’m very quick at what I do, and so I think I wrote the, uh, four- or five-page report of why it was important in—in a day or two days. Excellent, and what year was this again? You know, I think it was probably about, uh, 10 or 15 years ago. I mean, it was probably in the 90s—[inaudible] or something like that. Right, and who all—do you remember which people from the museum you worked with? Um, it’s one of those things that you can go look at and be proud that it’s still there, because it could be somebody’s patio brick, you know? And—and so it’s a real good place for kids to go and look at the way that things used to be. Excellent, and were there any other instances in Sanford, in which you helped with local preservation efforts? Um, yes. Uh, the Hopper Academy, which was the African-American school, h, over near the stadium. Uh, I put together the environmental assessment and some of the feasibility studies for—for looking at the rehabbing of that and making that, uh, another focal point, and because it was a wooden building and it had a lot of decay, it was really difficult, and the neighborhood, uh, didn’t lend itself to, you know—there were a lot of transients in the area, and people were sleeping near—in the school, and people were doing a lot of things that were just destructive. I’m not sure that worked out as well as I would have liked, but it was a real, eh, effort for someone to go over there and say, “We’d like to see, you know this—this kept for the community,” and so I worked on that, and, um, also, when I was the senior planner with Seminole County and worked, um, on comprehensive planning, I—I worked very hard to try to get a conservation element that reflected the importance of archaeological and historic sites, um, in—in Central Florida and Seminole County. In—in the profession that I have now, we do an awful lot of work in Seminole County. Uh, we worked for the airport in Seminole—the Orlando-Sanford [International] Airport. We’ve identified historic sites and identified preservation, uh, concepts for them. [inaudible]. We’ve worked for the Division of Historic Resources on the railroad sites[?] that existed here that came from the 1900s, when they were shipping an awful lot of, uh, produce out throughout—throughout the state and throughout different parts of the country, and so I’ve, you know, worked a lot on different aspects on Seminole County on—on cultural[?] resource assessments and evaluations, uh, both historic and archaeological resources for the county, and provided information for the of State of Florida. Excellent, and here’s a little bit of a different question. In your experience working in Seminole County and living here and growing up, how has it changed environmentally? You—what do you think are probably the biggest ways that it’s changed? And the tree was there, and they burnt it up and destroyed it, and it was considered an “accident,” and it was considered of no great significance, and I can remember riding my bike out to the tree when I was a child from Sanford. It’s—it’s probably halfway between Sanford and Longwood on [U.S. Route] 17-92. Uh, I can remember there was a wonderful book written by [Elvira] Gardner, it was called Ezekiel’s Travels. And—and Ezekiel, a little black boy, rode his bicycle out to the big tree and they documented that in the 1930s. An accident. So, uh—and I think that—it really has an impact, you know? The—the other thing that I can remember that’s changed so much is, when I was, uh, very young, I used to ride my bike down to the—the band shell, and to the, uh—to Lake Monroe, and used to fish there, and there used to be just the band shell, and just the sea wall, and in the last 25 years, you know, they’ve built, uh—they built hotels there, and, uh, they built, uh, mixed used development there. They have had varying degrees of non-success. Uh, but it’s taken away much of the character, you know? I can remember when the zoo was in Downtown Sanford, and, you know, it was a very small zoo. Sorta not like the really nice complex that they have now, but—but Sanford was [inaudible], you know—libraries were there, and it was a place that—that kids went, and young people went, and it was just very different. The [Sanford] Civic Center was a big, big deal, and they had dances every week, and it was just, you know—it was just a place that people went all the time, and, uh, I don’t see that in Sanford anymore. I don’t see that. You think some of the character is gone? [inaudible], and it’s just not something that I’m interested in participating in, you know? Probably there are a lot of people that do, but it’s—it’s just very different from when I was raised in Sanford. Yeah. As far as developmentally, what effect do you think that the arrival of like Disney Corporation and things like that had on the change, if any? Yeah, eh, Disney is a very large beast. And it has a lot of beasts that, uh, have attracted to it—whether it’s the whale beast or the, you know, uh, any number of other international destinations that I think that it’s affected probably not just all of Florida, but the Southeast. It’s the number one tourist destination, you know, in the world, u, and I think it makes Interstate [Highway] 4, which used to be a wonderful opportunity to go to Orlando and you just got on the interstate and ten minutes later, you were in Orlando, and today, it’s, um—it’s questionable if it even functions at all. You know, we have a—we have a toll road system, in which, uh, I was assigned to that. I was Deputy Director of the toll way [inaudible] before they actually started developing it, and it was supposed to relieve the traffic and make traffic a lot different in Central Florida, but Central Florida is so densely populated that it was probably nothing can significantly change that. You know, whether it’s a rail system that they won’t put in, it will cost billions of dollars, whether it’s increasing lanes on I-4, or whether the [Central Florida] GreeneWay builds out. It’s—it’s not going to make the quality of life significantly different, in my opinion, you know, but that’s just part of the price you pay. Yeah. Just out of curiosity, how many lanes did I-4 use to be? [laughs]. You know, I think it was always six—divided six. Yeah, um, eh, it—it had fewer ramps. And so they put in more ramps and more access, and it’s—it’s—the speed is much quicker today than it’s ever been. Uh, the Fairbanks [Avenue] curb is a problem that people have been having for years, and everybody’s looking at the engineering and saying, “It’s got to be engineering.” They say, “It’s got to be, you know, your problems,” you know? People are traveling between their ears if they don’t pay attention to traffic, and that’s why we gotta have people at such a quick pace today, you know? It used to be if you made it to work at 8- 8:30, you know, or if you, you know, were just there. Now, everybody fills the building up at 10-to-8, and, you know, so consequently, everybody gets on the interstate and it’s as fast as they can go, and it reminds me a little bit of Atlanta[, Georgia]. You know, if you’re not doing 80 [miles per hour], you’re not getting there. I think that the—I think that I-4 is quickly approaching that. If you’re not doing 70, you’re probably not going to make it. You know, that’s just part of reality, part of the [inaudible], and the—the—it’s the quickness of what happens today. It wasn’t like that in the, you know, 1960s. And what he did at the Navy base? You know, and [inaudible], and I know today—you know, 2012—we’re still talking about the Cuban Missile Crisis and trying to figure out what really happened, and when you think about the people that were going to do whatever they were told to do, you know, there’s a lot of frighteningness[sic] there, and there is a lot of, Have we gone that far? Or, Are we still in the same place? I kinda think about that occasionally. Excellent, and once again, my name is Ian McLaughlin, and I’m interviewing Dr. Storm Richards at his home in Geneva, Florida. Today is Wednesday, the 24th of October, 2012. Correction: The Walt Disney Company. McLaughlin, Ian and Richards, Storm Leslie. 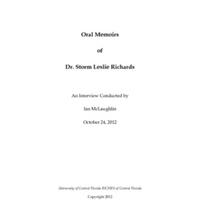 “Oral History of Dr. Storm Leslie Richards.” RICHES of Central Florida accessed April 20, 2019, https://richesmi.cah.ucf.edu/omeka/items/show/5430.